Death and Dying in Tibetan Buddhism. Hong Kong. Dealing with death and the process of dying is a reality we all have to face for ourselves and for those close to us. From all the Buddhist traditions in the world, Tibetan Buddhism offers the most detailed teachings and practices for preparing for death and the intermediate state between lives, known as the bardo. The most important technique for ensuring a favourable rebirth is the Vajrayana technique of phowa, the transference of one’s consciousness at the time of death. It is equally important to reflect on the way we conduct and develop ourselves while we are still alive. The ‘Three Excellences’ is an essential Tibetan Buddhist teaching for preparing ourselves by developing pure motivation, undertaking correct practice, and dedicating the merit from our virtuous deeds for the benefit of all sentient beings. His Eminence Chöje Ayang Rinpoche was recognized at a young age as the wisdom incarnation of Terton Rigzin Chögyal Dorje by the Sixteenth Gyalwang Karmapa Rangjung Rigpa Dorje and Yongzin Jabra Rinpoche. He is the founder of the Amitabha Mandala and Retreat Centre in Nepal, and the Thubten Shedrup Jangchub Ling monastery in India, and has worked tirelessly over the years to develop community projects, such as a school, medical clinic, and education programmes for children in India and Tibet. Ayang Rinpoche is considered to be the foremost authority on Buddhist afterlife rituals and the world’s living phowa master. A lineage-holder of both Nyingma and Drikung Kagyü teachings, he continues the unbroken line of succession of the Drikung phowa lamas, and he has granted Vajrayana teachings and initiations across the world. 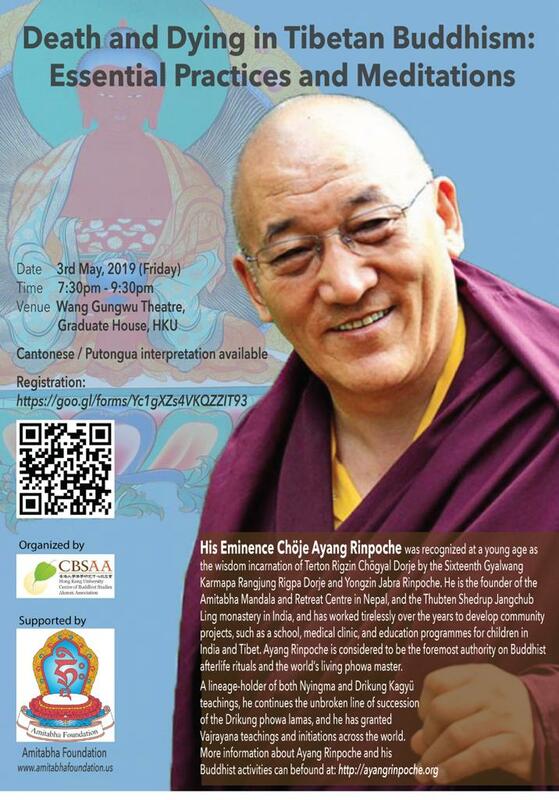 More information about Ayang Rinpoche and his Buddhist activities can befound at: http://ayangrinpoche.org. note: If registration exceeds seat limit, priority will be given to CBSAA member.